Live at either Volkshaus or Limmathaus, Zurich, Switzerland 1970. Try writing a song with a title like Ramadhan. See how often radio will play that. But back in 1970 after the Beatles broke, there were many possibilites. East Of Eden wrote just such a song, Ramadhan, and amazingly, it made No. 2 on the French pop charts. East Of Eden also wrote a song titled Confucius. Both are on this amazing live recording. The presence of the violin in a rock set-up often gives the music a jazz flavour. 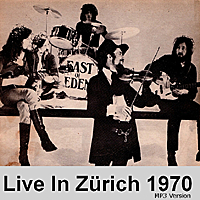 In the case of East Of Eden at this 1970 gig in Zurich, and performing tracks from their first two albums, Mercator Projected (1969) and Snafu (1970) respectively - especially the latter, their music had an Eastern tinge as well. Snafu made the top 30 in the UK and Jig-a-Jig, which was the encore number in their set, an ironic throwaway twist to the rest of their show, became a top 10 single on it's re-release in 1971. 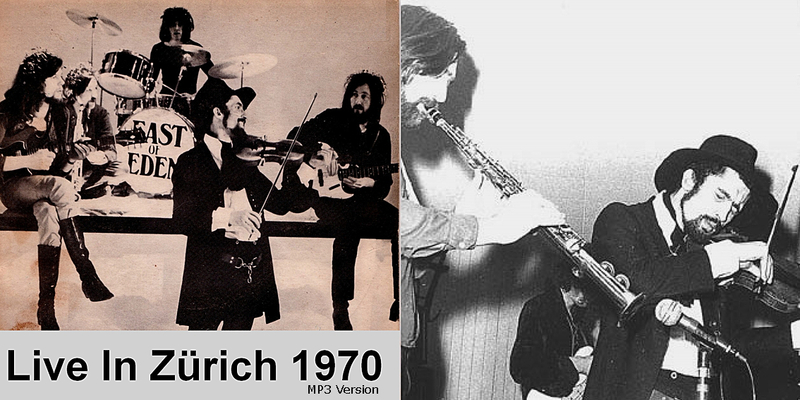 Made up of saxophonist Ron Caines, violinist Dave Arbus and guitarist Geoff Nicholson, the band was originally formed in Bristol in 1967 but moved to London in 1968 taking on board ex-Graham Bond bass player Steve York (later with Vinegar Joe) and drummer Dave Dufort. This is what the group's website (www.eastofedentheband.com) has to say: "If you ask anyone who inhabited the rock venues of the late '60s and early '70s, who the most memorable bands on the circuit were, the name East Of Eden will always crop up. Yet now they are largely forgotten, overshadowed by the obvious names such as King Crimson, The Nice and Yes, and their uncharacteristic hit, Jig-a-Jig, only served to confuse people as to the kind of music they were actually producing at the time. "The original incarnation of the band was never categorised in the general mainstream of 'progressive' rock which invariably relied on guitar and keyboard pyrotechnics. Instead their front line of electric violin, played in an almost Hendrix-like mode, and saxophone bordering on free form jazz mixed with bluesy guitar gave them a unique identity." Reviewing the Snafu album, Duncan Glenday wrote: "This music is probably the great-grand-daddy of today's avant garde progressive music. It is an eclectic blend of psychedelia, jazz, blues, folk, celtic, eastern, and various forms of world music. 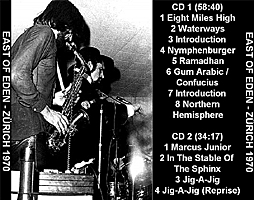 Instruments include bass, flute, sax and alto sax, trumpet, drums and guitar - and keyboards are largely dispensed with in favor of Dave Arbus's electric violin which provides plenty of texture and background, as well as taking the lead in many passages. There are long sections driven by a jazzy bass guitar playing with almost loop-like repetition, while solo spots are taken in turn by guitar, violin, flute and sax. Vocals are sparse, which is fortunate as Geoff Nicholson's singing isn't strong. "With song titles like Xhorkom, In the Snow for a Blow, Nymphenburger and Leaping Beauties for Rudy, you can imagine that this is an off-the-wall piece that isn't meant to be taken too seriously. It's fun, it displays some stellar musicianship, and it's adventurous. This was originally released in 1970 when experimentation was peaking." In March 2005, founding members Caines, Arbus and Nicholson regrouped to release the Graffito album. 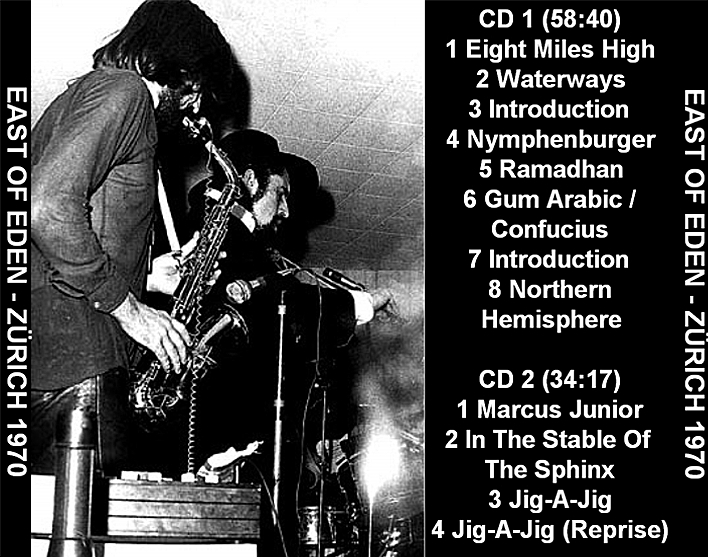 A word of thanks to the seeder who shared the lossless version of this audience recording on the internet. The recording can be considered good but not excellent though the performance more than make up for it. 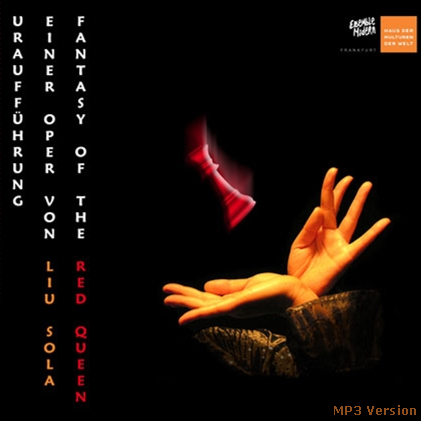 Click here to order Snafu and other East Of Eden albums.